Shopping for a mattress online is supposed to make your life easier. Not having to drive to a store. And most brands only offer one mattress, so you don’t have to worry about comparing different models. But with so many new mattress brands to choose from, shopping online can be almost as hard as visiting brick-and-mortar stores. And since you can’t go to a store to try out the feel of the mattress, you may be worried that you aren’t picking the right one. Here, we’ll walk you through of the four leading online mattress brands. And remember, there’s not one mattress that’s right for everyone. Compare the different features- especially the firmness- to find the mattress that’s right for you. And keep in mind that all of the brands featured here have great return policies, so you’ll have at least 100 days to try out your mattress. You may want to consider trying a few different brands to find one that best suits you. 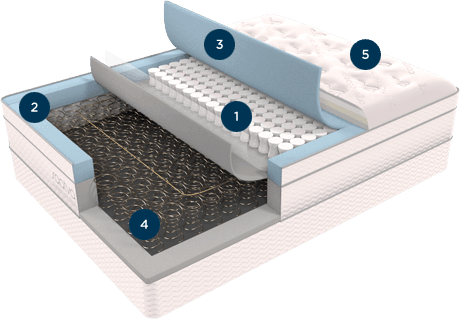 Before jumping into the details, here’s a quick overview of the different mattresses. Do note that the Saatva offers three different mattresses of varying firmness. Now, let’s get into the particulars. To see how the mattresses stack up, we’ll compare them in four different areas: build quality, firmness, price, and return policy. And refer to the table above if you want quick comparisons between the different brands. The first thing you’ll want to look for in a mattress is its build. How well is it made? How durable are the materials? How much support will you get? Let’s see how the four brands hold up. Casper builds its mattress from four separate layers of foam. It gives you great comfort, while still providing enough support that you won’t feel like you’re sinking too far into the mattress. All of the foams in the mattress are of high quality. The first layer is base foam, and it’s the thickest, at 5″. This layer is followed by 1.5″ of poly foam. And then there are the top two layers, with 1.5″ of memory foam and 1.5″ of poly foam. The base layer provides great support, and the poly foam makes the mattress comfortable. The memory foam helps contour the mattress to your unique body shape. Like Casper, the Leesa uses multiple layers of foam. However, the Leesa only has three layers of foam. The foam is well built and durable, so the Leesa should hold up well with years of use. The top layer of the mattress has 2″ of Leesa’s patented latex foam alternative. It gives you all of the comforts you’re used to from latex foam, but it’s much more durable. Then, you get a 1.5″ of memory foam, which helps the mattress bend to your shape. Finally, you get 6″ of support foam, which helps keep the mattress sturdy. The Tuft & Needle is also a hybrid mattress. However, it has only two layers of foam. The top layers are 3″ of the company’s custom poly foam, meant to give you both comfort and support in one layer of foam. The second layer is 6” of poly support foam that gives you a solid base, and that keeps your back aligned. The foam quality here may not be quite as good as what you’ll get with the Leesa and the Casper. But it’s not far off, and you’ll be spending about half as much money. Unlike the three other mattresses featured here, the Saatva mattress is built with two layers of coils. This means it’s much more like a traditional mattress. On top of the two layers of coils, there is a euro-style pillow top with a thin layer of memory foam. This helps make the mattress comfortable, and the memory foam allows the mattress to accommodate your body. The first layer has foam encased coils. This is a blend of old and new, as you get the traditional coils mixed with the comfort of foam. The layer beneath this has support coils, which help make the mattress firm and give your body shape when you lie down. The mattress also has a layer of edge foam that makes the sides soft. The Saatva coils are really well built. The foam lined layer features over 800 individually wrapped coils, so you won’t get any sagging. And the pillow top is also durable, so you shouldn’t have to worry about it wearing down after a few years of use. This is the most important factor for a lot of people when it comes to a mattress. So how do the four mattresses featured here compare when it comes to firmness? Most online mattresses are designed to be medium firmness. That’s because these companies often offer only one mattress, so they try to choose a firmness that works for a variety of different people. That said, each mattress still has a unique feel. 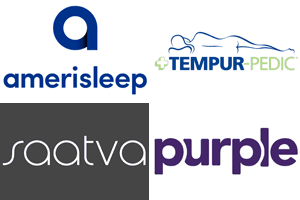 And keep in mind that Saatva is the only company featured here that offers multiple different mattresses of varying firmness. This will allow you to choose one that has the desired firmness. Casper is about average when it comes to firmness. If you are looking for a mattress that sinks deeply when you lie down, you won’t find it here. It gives great support, and the outer layer of foam wraps around you, so that it still feels soft and comfortable. Like the Casper, the Leesa is in the middle of the range for firmness. You’ll get plenty of support, so your back will stay aligned as you sleep. But you’ll get enough sinking and contour that the mattress fits your unique body shape. This makes it a really versatile mattress that can support different kinds of sleepers. The Tuft & Needle, like most other foam mattresses, is medium firm. The top layer of custom foam wraps softly around your body, giving you a nice blend of support and sink. It has a pretty similar feel to the Casper and Lisa, but may be just a bit softer. It’s great for those that want plenty of support, but still want to feel cushioned. The Saatva has a different build than the other three mattresses featured here. And it’s also unique in that it offers three different firmnesses. This makes it a great choice for those that need a mattress with a lot of give, or one with none at all. Online mattresses offer a great deal compared to traditional brands. Why? Because you don’t have to do with middlemen. This will help you get a higher quality mattress for the same amount of money. The Casper mattress is the most expensive option featured here. You’ll have to pay around $1200 for your mattress. But this is still a great deal when you consider how much a similar quality retail mattress would cost you. The Leesa is very similar to the Casper, but with a slightly lower price tag. You should expect to spend around $1000. This is an excellent value when you compare it to brands available in brick-and-mortar stores. 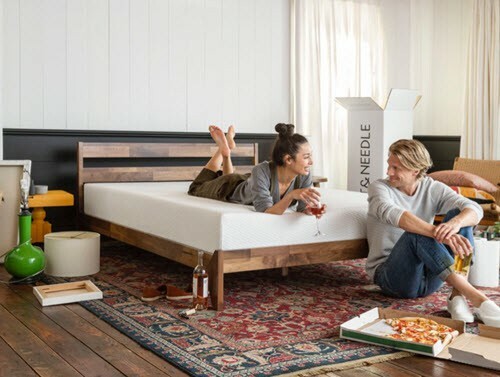 The Tuft & Needle mattress is marketed as a less expensive alternative to the Casper and Leesa mattresses. You’ll spend around $550 on your mattress. This is about as good as it gets from a high quality, brand name online mattress. The Saatva range of mattresses are all some of the most affordable high-quality online mattresses you can find. You’ll spend around $600, making it another great option for those who want to save money without sacrificing when it comes to quality. One of the benefits of buying a mattress online is that many of the brands have great warranty and refund policies. Here are how the brands compare. For the most part, they offer nearly identical warranties and returns. Casper was one of the early leaders when it came to offering free mattress returns. You get to test the mattress for 100 days. If you don’t like it, you get a full refund. And your mattress will be picked up for free and donated to a local charity. Like Casper, you’ll get a 100-day trial period after which you can return the mattress, no questions asked. Someone will come to pick up the mattress and donate it to a local charity. Once you decide to keep the mattress, you’ll get a 10-year warranty that covers any structural issues or defects from manufacturing. Tuft & Needle also offer a 100-day trial period, with free pick up should you not want to keep the mattress. It will then be donated to a local charity. The mattress also has a 10-year limited warranty that covers any issues caused by the manufacturer. The Saatva mattress does a bit better than its competitors when it comes to its return policy. You’ll have 120 days to decide if you think the mattress is right for you. If it’s not, you can have them come pick it up. Unfortunately, you’ll have to pay $99 for transportation costs. So, you may be wondering what the best overall mattress is. And the answer? It depends. Mattresses are really personal, and one person’s dream mattress can be someone else’s nightmare. To help give you a bit of guidance, we’ve picked what we think the best mattress is for a variety of different categories. If you are looking for a mattress with medium firmness, you’ll have a lot of choices here. But the Leesa stands out as the best option, especially when you factor in price. You’ll get a similar feel to what you get with the Casper, but with slightly better motion inhibition. That makes it great for those who are sharing the bed with a partner. And it’s a few hundred dollars cheaper. So, if you like both mattresses equally, you should probably go with the Leesa. Most online mattresses are designed to be middle of the ground when it comes to firmness. This makes them suitable for a wide range of sleepers and makes it easier for companies to offer fewer products. This helps them save money and streamlines production, but it means you have fewer choices if you need a firm mattress. Fortunately, Saatva is here to save the day. The company offers three different firmnesses. There firmest mattress is a great option if you need tons of support. Like we discussed above, online mattresses are designed to be medium firmness, so that they suit as many different sleepers as possible. That means a lot of them will be too firm for a lot of sleepers. Saatva makes three different mattresses for this exact reason. The softest Saatva mattress is, well, really soft. It’s great for those who need a mattress that sinks deep whenever you lie down. What if you’re fairly flexible on firmness, and just want the best deal? All of the mattresses featured here are good deals, relatively speaking. You’re getting excellent quality for the price, and great customer service. But Tuft & Needle stands above the other mattresses here for value. You get a really incredible mattress for hundreds of dollars less than the other brands. Is the quality as good? Not quite, but it’s close. One of the best features of online mattresses is the generous return policies. You’ll be able to try out all of the mattresses here for at least 100 days before you make a decision. So, try out a few different mattresses, if you’re really worried about finding the right one. There’s no financial commitment, and someone will come to pick the mattress up for you if you decide to return it. It may take some patience, but you’ll end up with the perfect mattress.